M82 is located in the constellation of Ursa Major and is approximately 12 million light years from the earth. 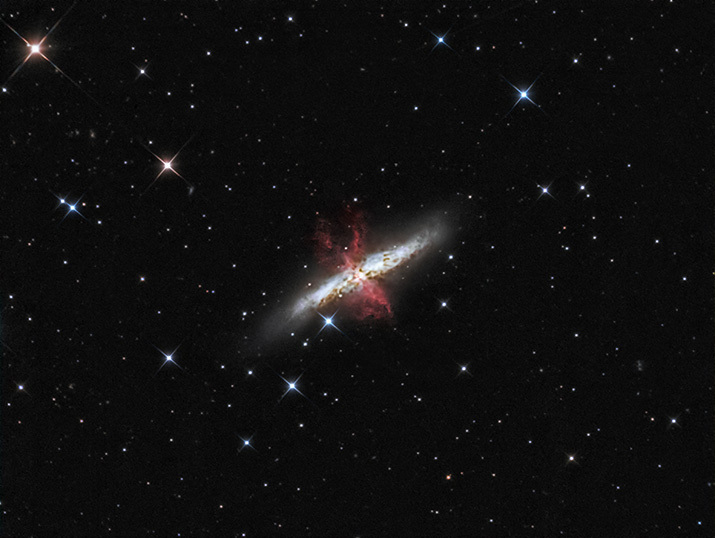 M82 is also a starburst galaxy and is the closest such galaxy to the Milky Way. Starburst galaxies show a very high rate of stellar formation of at least 10 times greater than occurring in the Milky Way. This prodigious star formation is thought to be the result of a close encounter, between 300 and 600 million years ago, with nearby M81 (Bode's Galaxy). The gravitational interaction between the two galaxies is thought to have triggered the collapse of gas and dust clouds within M81 resulting in the formation of vast numbers of new stars. Strong stellar winds, and shock fronts from supernovae, rsulted in a chain reaction of stellar formation. The high rate of new star birth, with their associated strong stellar winds coupled with the violent explosions from supernovae, is thought to be the source of the spectacular red filaments extending outwardly from the galaxy core.